Hello again! I love it when Fall takes hold and the air is crisp and cool. As the weather gets chilly I like cooking heartier dishes with the intent on elevating comfort food. I got my hands on some beautiful grass fed organic beef short ribs from The Organic Butcher of McLean and was instantly inspired to create this recipe. This cook is a long one so make sure you have some time on your hands before getting started. If you do not have a smoker don’t fear, I will talk you through how to make this recipe at home using your oven. 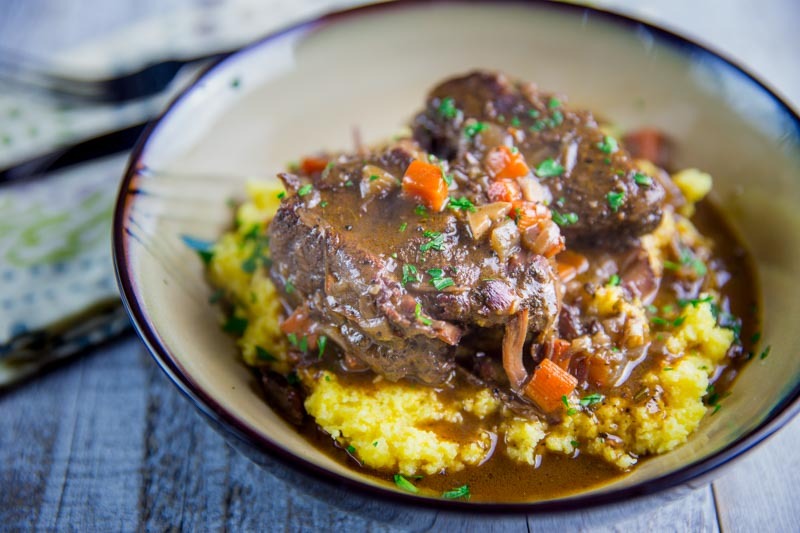 Now sit back, grab a nice glass of McManis Family Vineyards Cabernet Sauvignon, and enjoy this post for Braised Smoked Beef Short Ribs. Now if you haven’t cooked with beef short ribs before I will give you a little background. The ribs are taken from the rib/brisket area of cattle. This cut makes for very flavorful meat but it is not naturally tender so cooking the ribs for a long period of time gives you the best flavor. There are two types of short ribs: 1) Flanken, which are cut across the bone and are 1-2″ in length and 2) English, which are cut parallel to the bone leaving the bone up to 6″ in length. This recipe focus on Flanken beef short ribs. For this cook I used Meat Church’s Holy Cow rub. This rub is well balanced and screams Texas with a hint of garlic and pepper. I set my Big Green Egg up for indirect cooking, set the temp to 225°, and added Pecan Wood for the smokey flavor. I used a drip pan full of water to help with the moisture. I let the ribs smoke like this for 2 hours until they measured 175° using a meat thermometer. I pulled the ribs and let them rest while I prepared the braising liquid. As stated earlier I wanted to elevate this comfort food so the braising liquid started with a nice bottle of Cabernet Sauvignon. Fresh onion, carrot, garlic, rosemary, came next. Topped off with beef broth and tomato paste. I mixed the braising liquid together in a dutch oven on my stovetop while preheating the oven to 325°. Once the liquid was mixed together and came to a boil I placed the beef ribs inside (if the liquid does not barely cover the ribs then add some water). I covered the dutch oven and placed it inside my oven and let it roast for 3 hours turning the ribs every 30 minutes or so. NOTE: If you do not have a smoker or just want to skip that part then sear the beef ribs in the dutch oven first for 2 minutes per side until the ribs are evenly browned. Set aside and follow the rest of the directions above. After 3 hours I made some creamy polenta, separated the meat from the bone, and served in a bowl. This meal was incredibly delicious and worth the long wait. This recipe for Braised Smoked Beef Short Ribs takes comfort food to the next level. Savory, rich, and balanced this dish is the perfect foil for a cool fall evening. Bring the liquid to a boil, cover the pot, place in the oven, and cook, moving the position of the ribs every 30 minutes or so to be sure that they are covered with liquid and are cooking evenly until very tender (about 2½ hour). Serve the rib meat over polenta, mashed potatoes, etc.